Here is a little bit about what I learned…..
Acai is a berry that grows on 40-50 feet tall palm trees in the Amazon Rainforest in Brazil and it contains high amounts of antioxidants, omega essential fatty acids, and fiber (those 3 things are why it’s considered such a powerful superfood). In the 90s in Brazil, they started freezing acai (in the Amazon) and sending it to other parts of the country (especially Rio de Janeiro which is like LA for trendsetting). 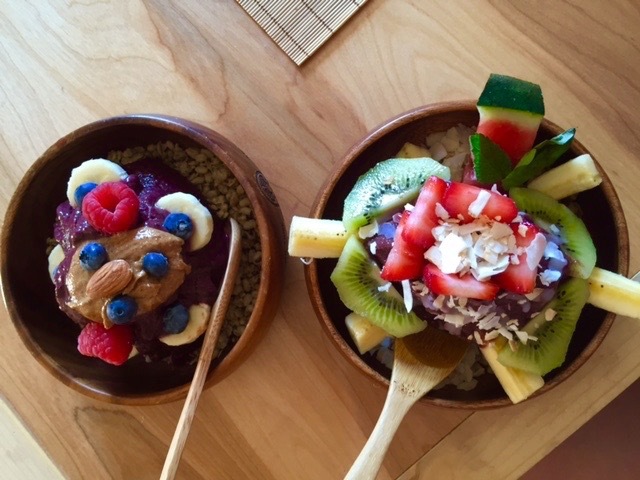 In Rio and the other beach towns they started making smoothies and thick bowls of acai blended with other fruits. 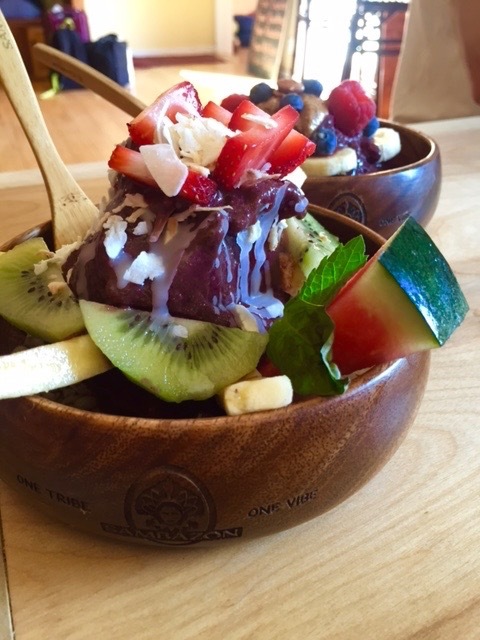 They typically top the bowls in Rio with granola and banana. 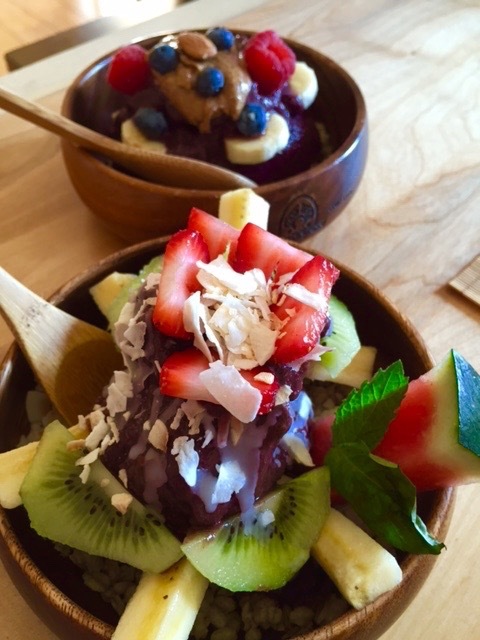 Our cafe is called Carioca because that is the name of a native from Rio de Janeiro where the acai bowl became such an integral part of the active, healthy, vibrant lifestyle. In the USA, Sambazon (the company that we were both execs at for close to 20 combined years) brought the frozen acai here in 2001 which began the whole acai industry outside of brazil. Warm welcoming entrance after you have walked through a beautiful garden space. I ordered the summer special which had watermelon, strawberries, basil and mint. With each bowl you add 2 toppings, aside from the granola and bananas. They suggested coconut, which was a great touch and kiwi. It was so refreshing and tons of great flavor. We were further spoiled by having the opportunity to taste the Coconut Water that was on tap. 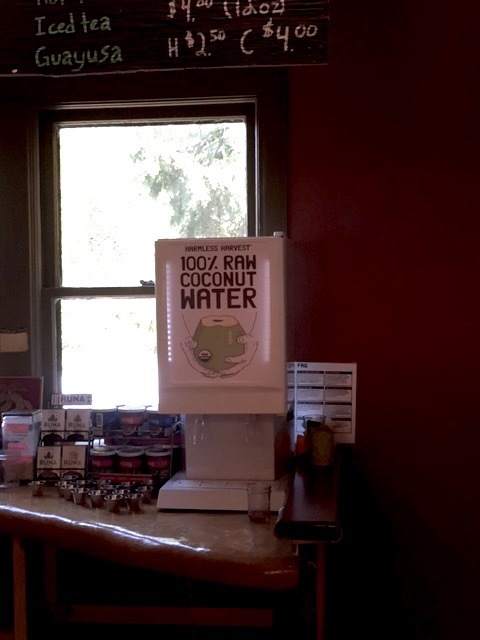 By the way they are the only place in Portland that has coconut water on tap. Fantastic. Please know that even though I was spoiled and got special attention that all the opinions are my own. Just to prove how good it was my son took his girlfriend back the very next day so she could experience it too. Atmosphere is spectacular. The indoor space is somewhat small yet cozy, but the outdoor space is big and beautiful including a stage/yoga platform. Pricing is $9 for a full size and $6 for half, but specials are little more. Drinks include tea, coffee, juices, kombucha and smoothies. Not to miss item would be the Raw Coconut Water. You are here for the bowls, so I’m assuming you will be ordering one of those already. 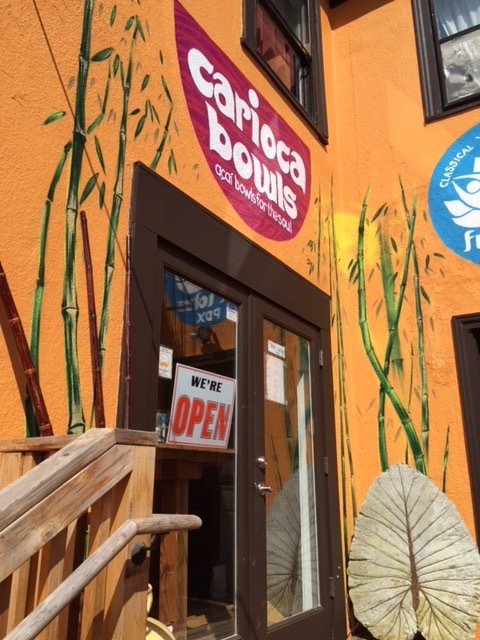 Carioca Bowls is located on NE Alberta Street. That’s funny. I went there for the first time on Friday! What a cute, funky space. I got the summer special as well, really different but delicious!